Antarctica is the coldest, windiest, driest continent on the planet. With temperatures as low as -89°C, it is by far the coldest place on Earth. Even though the continent is covered in ice, it's actually a desert, with only a few centimetres of snow and rain every year. The waters of the Ross Sea are a chilling -1.5°C and yet the depths remain unfrozen because the ocean's salty water lowers the freezing point. Most organisms would freeze to death in waters so cold, yet the Ross Sea is filled with life. The animals here have evolved over millions of years, all the while developing adaptations which allow them to survive in the harshest climate on Earth. In the winter, the sun never rises, air temperatures drop to - 40°C, and the ocean around Antarctica freezes into a solid slab of ice, several metres thick, effectively doubling the size of the continent and covering most of the Ross Sea. During the summer, the sun never sets and temperatures creep just above freezing, breaking up the massive ice pack. This freezing and thawing is one of the most dramatic physical seasonal events in the world. Climate is a major factor driving any ecosystem, but it's particularly important in the Ross Sea. In the winter, winds up to 200 kph shoot off the Ross Ice Shelf and out across the Ross Sea. These powerful winds push the blanket of seasonal ice away from the edge of the shelf, creating large pools of open water called polynyas. When the sun finally rises, bringing light and warmth, the phytoplankton in these pools bloom prolifically. The bloom is so large and dense that it can be seen from space. Each summer this bloom kicks the Ross Sea food web into life. 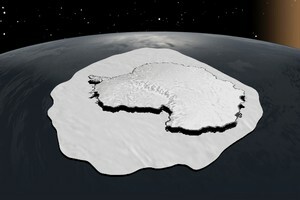 The surface area of Antarctic Sea ice increases dramatically during the winter.